Mosey On and crew are safe, dry, and still afloat. We ran for cover on Friday and spent the Labor Day Weekend thoroughly lashed to pilings in St. Michael’s, MD on the eastern shore of the Chesapeake. We made the choice of St. Michael’s because we wouldn’t have to cross the Bay as Hermine bore down on the Mid-Atlantic and we would be relatively far north up the Bay to avoid much of the storm’s associated surge. We also chose St. Michael’s because we would have the option to get off the boat safely with somewhere to stay. The wind certainly blew and the Miles River that leads to the town grew rough, but nothing to suggest the hurricane working its way up from Norfolk along the Jersey shore. I think we were lucky. We came in out of the natural protection of the narrow creeks and coves of the Wye River to take our chances in Town. It worked-out. The wobbly track of Hermine might have found us there with nowhere else (at Mosey On speed) to go. It is a truly sobering experience to make your best call and still realize that you might lose the boat to the storm. We were not alone in this, it’s just a part of living aboard. We left St. Michael’s this morning. Blue skies, dry air, and a fresh breeze beckoned us back to our favorite haunts up the Wye River. We’re well-stocked with provisions and grog, so we plan to stay through the weekend. On Saturday evening there’s an on-the-water benefit concert for the River Keepers featuring a band called the Eastport Oyster Boys. Apparently you arrive by dinghy with nosh to share with the floating crowd. It’s an annual event here, and not to be missed! After the hoopla of the weekend dies down, we plan to turn Mosey On to a southerly course down the Chesapeake and revisit some favorites spots along our route. 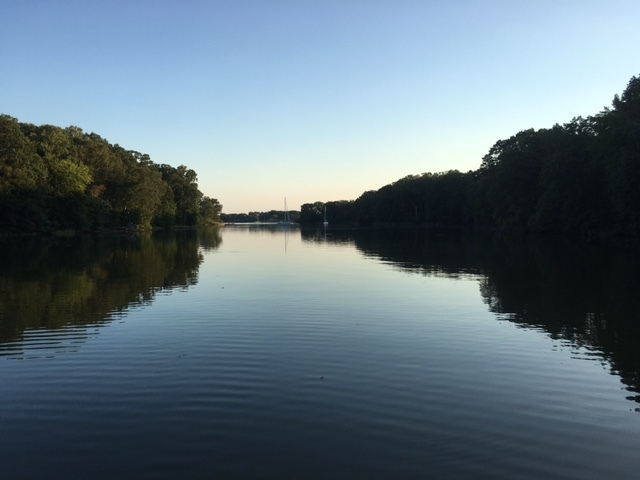 For several days, Mosey On and Crew have been exploring the rivers, creeks, and coves of Maryland’s Choptank River and environs. This is the riverine setting for James Michener’s Chesapeake. As I write this, Mosey On is swinging on her hook in “Baby Owl” cove, a drop dead beautiful anchorage off Leadenham Creek. The shore is lined with mature trees, only a couple houses set back under them, no boat traffic (and their attendant wakes), the waters quiet….and absolutely infested with sea nettles (jelly fish). Almost paradise…but with a catch. The temperatures here range from the mid-70s to highs in the upper 80s to 90s. The lower temps realized after a brief thunderstorm passes through with its attendant spike in humidity. 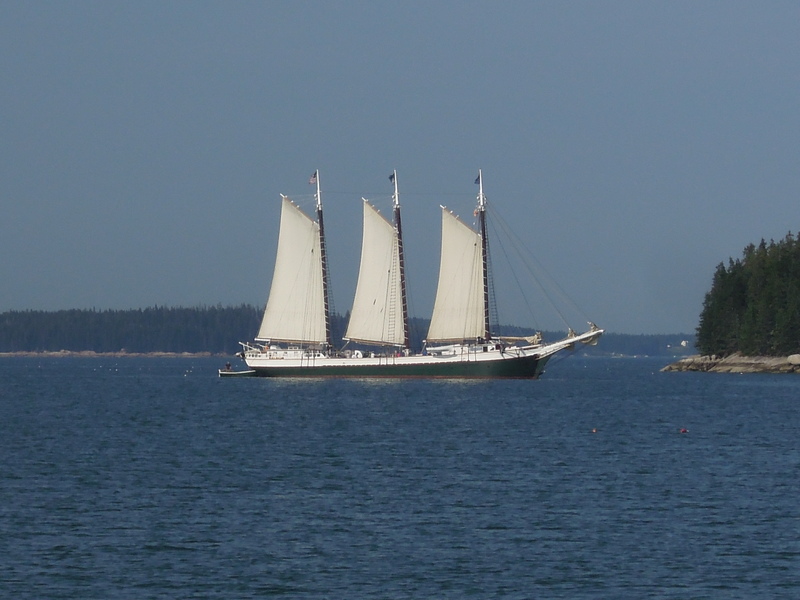 We are not surprised by this Chesapeake weather….it’s why most cruisers pass it by and head up to Maine…But for other commitments, we would have too! But it’s the choice we made. The thing is, if ever there were a great place to anchor in oppressive heat & humidity, and a place to plunge-in to cool off, this is it! Except for the aforementioned sea nettles…. Mosey On and crew have never exhibited a particular interest in truly “roughing it”, so we’ve done the obvious and gone ‘inside’ and turned-on the air conditioning. As I write this, I do feel conflicted. We’re here, in a beautiful place we’ve taken some effort to get to and I’m sitting inside, on a boat….while nature beckons! On the other hand, the sweat has stopped rolling down my face and fingers so I feel safe using this electric appliance. And other than the scoffs and ridicule I may have to endure from more stalwart (and sweaty) sailors, I know there is likely another (nasty) price to pay. Remember our friends the sea nettles? Although I don’t attribute intent, they have an unfortunate way of wafting too near the cooling water intakes for our generator and three air-conditioning units. So….too often they get sucked-in and end their lives clogging strainers designed to keep them out of the pumps. Which is good for the pumps, but the inevitable strangulation of the cooling flow from their remains will render our air conditioning inoperative! Yes, we can dive into the bowels of the boat and clean the strainers (again). It should be noted that the little critters can sting (even well-dead)! You pay a price when you mess with the natural order of things…air conditioning on a boat? Moseyin’ On …in a Chesapeake Summer! Mosey On and crew are still holed up in Port Washington….We came here to await the passage of an expected “gale” offshore before proceeding on down the Jersey shore toward Norfolk. Then we heard about Tropical Low Joaquin (soon to become a hurricane) and quickly came to the realization that we might have to wait a bit longer, perhaps a couple of days, before resuming our cruise south. We spent three nights on a town mooring out in the harbor, but the arrival of the leading edge of The Gale (these things apparently don’t warrant names) made the third night a bit too rambunctious and I stood “anchor watch” all night until we could assess our options in the light of day. [“Anchor Watch” is a slight misnomer…You can’t see the anchor well dug (hopefully) into the sea bottom. But you can see what happens if it loses its grip or the line to the mooring ball parts and you start drifting with wind or current. The bang or crunch of a collision with something in the wee hours of darkness should not be your first clue…]. The winds, rain, and chop in the harbor were not abating, so we called a local marina to see if they had space for us to tie up in a slip. It might still blow, but I hoped to get some sleep! The morning also brought the chilling news that Joaquin might well be aimed right at us. Memories of Hurricane Sandy are still fresh on folks minds here. In truth, the weather gurus could find no consensus of where he might make landfall…so there was nowhere to run until we knew more. Port Washington is a very well protected harbor on the west end of Long Island just above New York at the head of the East River. If Joaquin came to New York, we were sheltered from storm surge, but not the wind. So to start our preparations for both the fast approaching gale…and the possibility of Joaquin, we set about securing Mosey On to the dock with every stout line we had aboard, wrapping the critical points with chafe protection, and securing anything that might blow or add to Mosey’s considerable inherent windage. We made lists of additional tasks to accomplish (like duct-taping doors, windows and hatches) if and when we had a more definitive indication of Joaquin’s track toward us. Then The Gale arrived. More than a hairy description for a windy day on the water, a gale is defined as sustained winds or frequent gusts of 34-47 knots (about 39 to 54 miles per hour). Marry that up with bands of rain squalls…Hairy enough! Mosey On and crew had come into the Marina on Wednesday, on Friday morning we learned that Joaquin had taken a turn out to sea and away from U.S. waters. That was certainly great news. But The Gale continues unabated. It’s Saturday night and the latest advisories call for it to continue in these waters at least through tomorrow night. I don’t know if this is just one terribly persistent gale…or a string pummeling us one after another. I do know that I have never experienced such unrelenting wind and squalls for so many days in a row! But we are safe…and I’ll get at least some sleep tonight (you become somewhat accustomed to the howling)…. It’s a very foggy day over pretty much all of Penobscot Bay with a heavy mist thrown in….but this kind of weather has been the exception more than the rule. It’s a good day to sit warm and dry in the pilothouse and catch up on the writing I neglected on the gorgeous days we’d been enjoying while sampling only a few of the Bay’s many outer islands and “thoroughfares”. Thoroughfares are the favored, buoyed channels among groupings of small islands. As such they bear the brunt of the both commercial and recreational boat traffic . The lobster boats use them to run at speed to their favorite lobster grounds. Recreational boaters, often less familiar with the smaller channels between rock outcroppings and myriad islands, speed through them as well. But these well marked and heavily traveled passages are a mixed blessing in the fog…where speed and proximity to others are left to each skipper’s judgment. Not all cowboys drive pickup trucks. Off the thoroughfares, the sheltered coves are quiet and unspoiled. 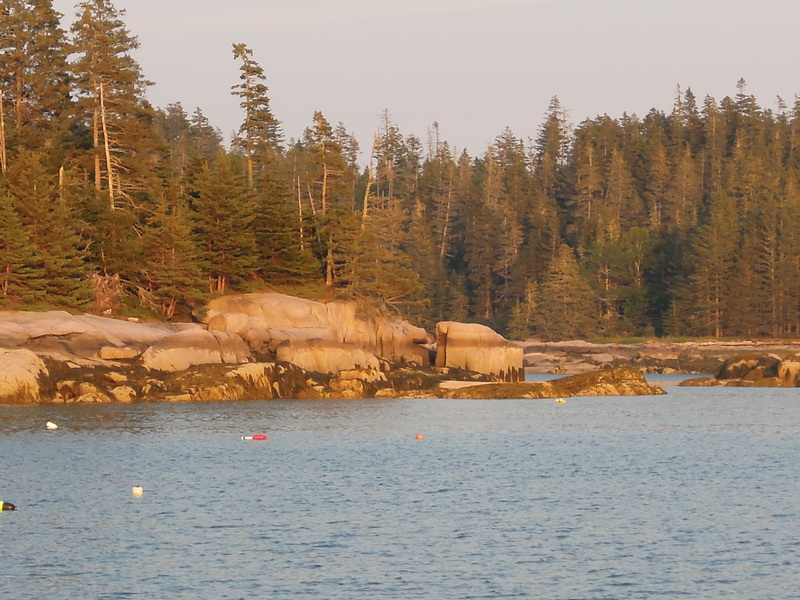 Some of these small islands are privately owned, some owned by the State of Maine, and some by The Nature Conservancy. The great natural wonders of the American West were saved by Presidents Grant, Teddy Roosevelt, and Congress. But apart from Arcadia National Park, most of New England is truly in the debt of some far-sighted and generous private individuals who have understood the value of these island’s tranquility. There are no fees or permits to drop our anchor in such a cove…just the expectation that we leave it as pristine as we found it. There’s another type of beauty on display here, too. On moorings, anchored in coves, or under sail or power there are more truly beautiful boats than anywhere I’ve been. 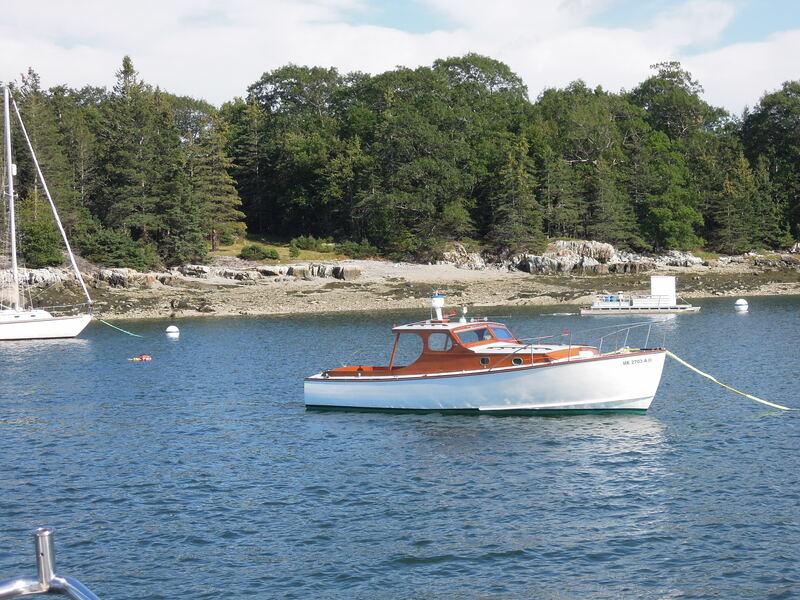 Not the working lobster boats, the migratory cruising sailboats, mega-yachts of the rich and famous, or long-range trawlers like Mosey On…each might be pretty in their context. I won’t belabor the reader with my highly subjective definition of what I view as a “beautiful” boat, but submit the following as a small sample. Now the test…how many lobster buoys did you spot??? And about the title of this piece…..I’m here puttering around aboard Mosey On while my beloved crew is on ‘shore leave’ in Chicago to welcome our newest granddaughter to our family (I’ll get my turn later). Mother and baby are both doing great. I’m a sentimental sort (if you couldn’t tell from the photos)….and I’d say this has been a very good summer! We interrupt this idyll with an important message from reality…..Stuff happens ashore (even when you run off to sea) and you find yourself dragged back to deal with it! 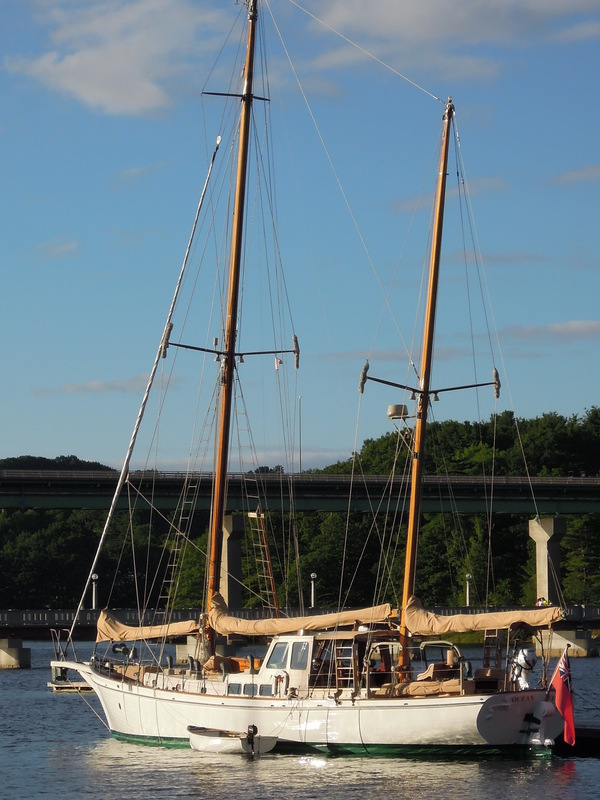 We made it to New Hampshire and our favorite anchorage up the Piscataqua River in Great Bay. The scenery is beautiful, the days have been sunny and the nights cool. Many good friends live just a short dinghy ride away and we have had time to visit at our leisure. It is truly a “Margaritas on the back deck at sunset” kind of anchorage. In short, exactly what we had in mind for a stopover on our way north. The annoying reality inserted itself via an email from friends back in North Carolina. It noted that a new supermarket was to be built on land presently occupied by a large indoor storage facility. Folks were cheered by the coming of this new market, but wasn’t that the storage center where we’d put all our stuff awaiting the building of our new house ashore? Well yes it was. Had we received a 30-day notice that we must vacate by the end of the month? Not until that moment! It has been our experience that resolving unexpected ‘hiccups’ like this always takes a bit longer than we would wish, so we had to ‘jump to it’. Much could be done by telephone: verifying the actual closure of the facility and the vacate date, arranging for a new storage unit, a truck rental, and some able-bodied men to do the heavy lifting. The remaining issues of our transportation down to N.C. and where to leave Mosey On took a little longer. Flying back to NC seemed the only reasonable option. We could take a bus from Portsmouth, NH to Boston’s Logan Airport or we could cruise up to Portland, ME and fly from there. Portland has more plentiful marina space, but fewer flight options. 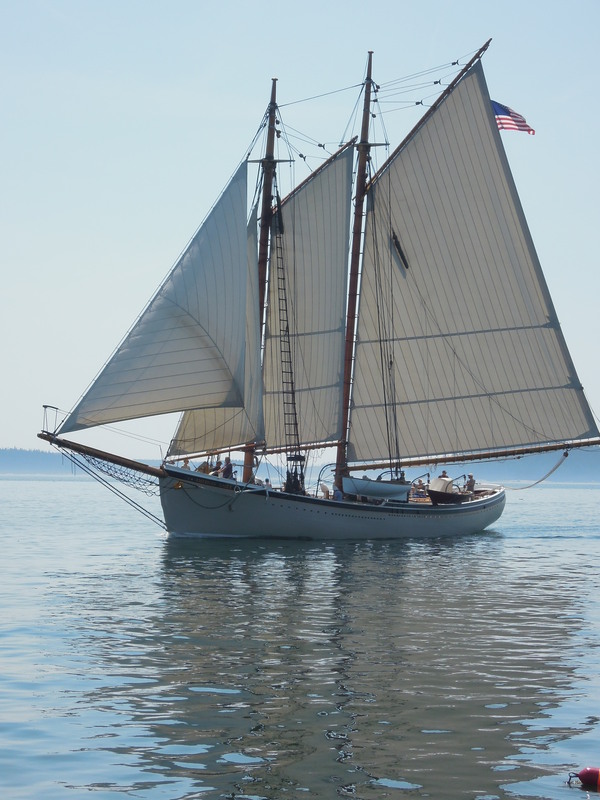 We couldn’t leave Mosey On on only her anchor because of the previously discussed need for electrical power for her refrigerator/freezers and finite battery resources. 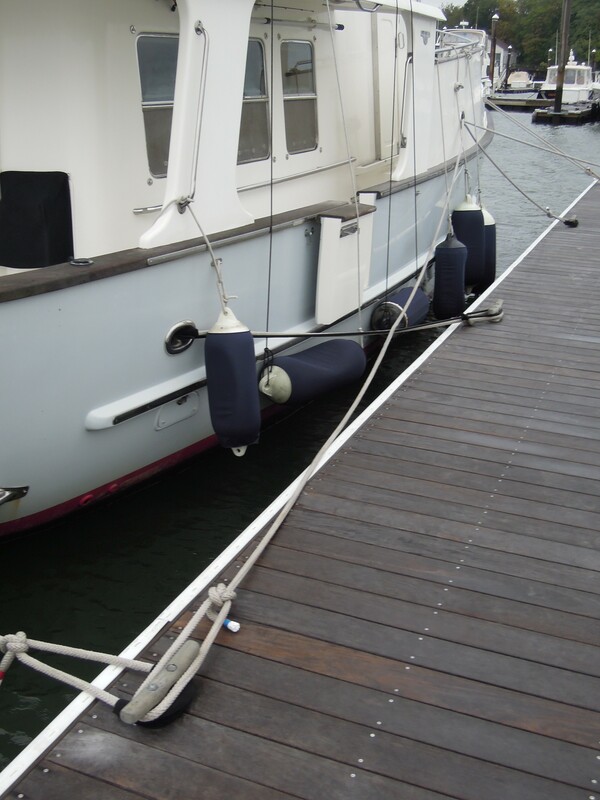 So….we negotiated the best deal we could with the local marina on Great Bay and left her tied to the dock parallel to the powerful tidal flow of the Piscataqua River. It was a bit like leaving your pet at a strange boarding kennel…. But it was difficult to leave Mosey On unattended on a mooring for even a few days. There are a few technical issues to ensure that her batteries do not run-down left unattended. Apart from her engines, Mosey On depends on electricity. Lots of it, stored in large 12 volt batteries. We can leave her for several hours, even a day or two if the batteries are fully charged…but more than that, not so much. Of course, we simply turn off the electronics, lighting, and fresh water pumps. We do not turn-off the bilge pumps. But the largest draw on our batteries comes from our two refrigerator/freezers. They are a joy when it comes to provisioning Mosey On for a cruise…lots of space for dairy products, vegetables, and frozen meat. On a mooring, however, with no one to run the engine or the generator they would run the batteries dead. The solution was to take all of our refrigerated provisions OFF the boat and turn off the refrigeration. Sooo…We arrived at the kids’ new home with two small duffels of clothes….and bags of groceries in need of a freezer. We returned home to Mosey On Wednesday evening with our cold provisions and a granddaughter in tow. She is the adventurous sort, so we sat down to plan a mini-cruise just for her. 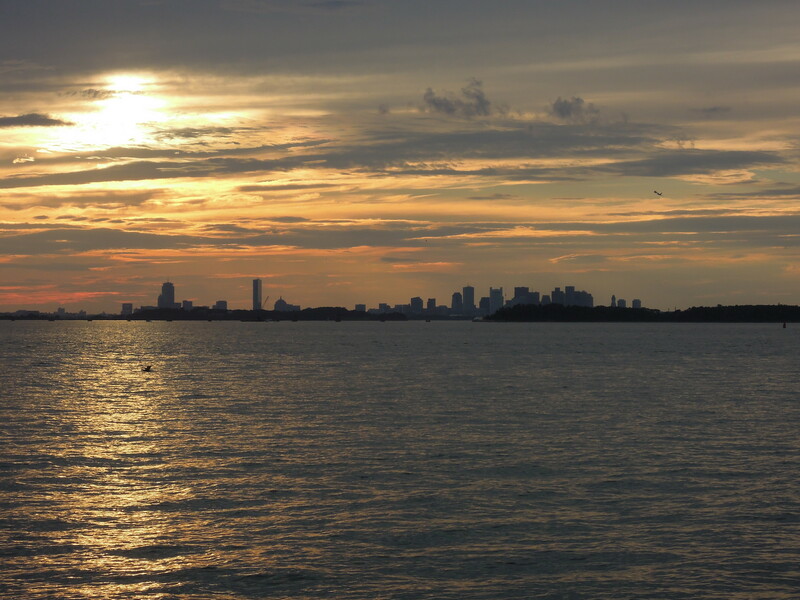 Our plan took us from Scituate to the islands of Boston’s outer harbor with spectacular views of the city skyline as the sun set. The following day we would take a short hop across the Bay to Gloucester where we literally dropped in on their annual Feast of St. Peter – patron saint of fishermen. That city was in full-on festival mode – the fishing boats dressed-up in pennants, banners in the street, a midway, and crews practicing for Saturday’s classic gig (boat) races. 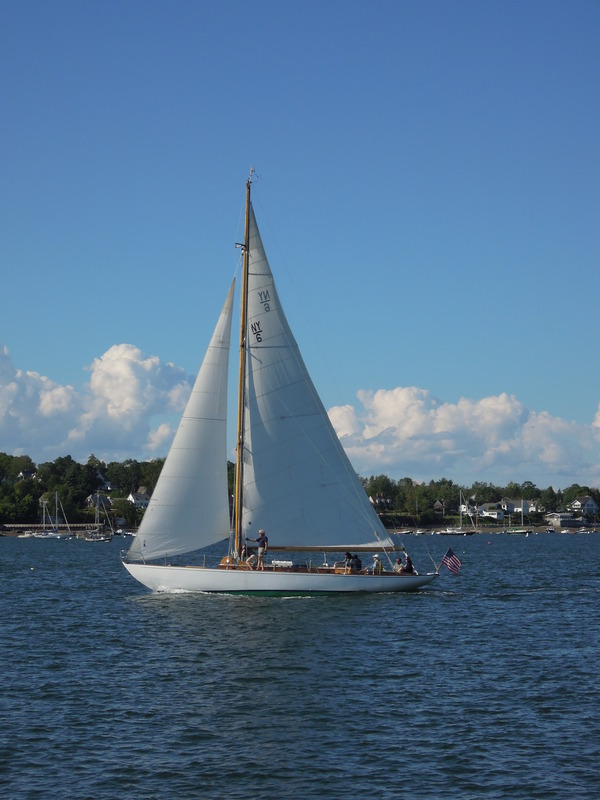 We would like to have stayed, but the forecast called for a gale to sweep across Massachusetts Bay waters late Saturday night. However intrepid the boat and crew, we don’t do gales…..so we motored back to Salem and snug shelter near the heart of the old town. Moseyin’ On is all about taking some time to see or do new things. So the whole crew took shore leave to spend the afternoon at Salem’s Peabody-Essex Museum. Although we had visited many times while we lived in New England, we had never seen their prized exhibit of a complete Chinese family home: disassembled, brought here and reassembled brick by brick. It is an extraordinary exhibit. With no crowds and a curious granddaughter, we took the time to fully enjoy it. Back on the boat after dinner ashore, a cutthroat game of “hearts” (beloved by the youngest crewmember), and one more check of Mosey On’s dock lines, we settled-in to await the storm. It blew across our harbor at 3:30 AM [I know the exact time, your honor, because I looked at my watch!] Lots of wind, buckets of rain……and only slightly diminished 12 hours later as I write this. 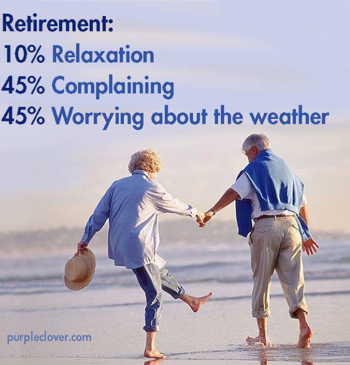 The storm may not blow out until later tomorrow…. So we’ll sit a spell……Moseyin’ On another day!